Pain that radiates down one or both legs. Pain that keeps the child from sleeping. More serious causes of back pain need early identification and treatment or they may become worse. Always see a doctor if your young child’s back pain lasts for more that several days or progressively worsens. Your doctor will begin by learning about how the problem developed. Then, he or she will conduct a physical examination of your child. Your doctor will ask general questions about your child’s overall health and more specific questions about the pain. The questions and physical examination will allow your doctor to determine which of a number of conditions is responsible for your child’s back pain. Your doctor will want to know when the pain began, if it was associated with injury or demanding activity, and whether it has improved or worsened. He or she will ask if there is anything that makes it worse, and what your child does to make it less painful. It will be important for your doctor to kow exactly where the pain is felt, how severe it is, and how much it interferes with the child’s schooling and activities. If the pain shoots into a leg it could mean that there is pressure on a nerve. Your doctor feels each vertebra and looks for deformities in the alignment and mobility of the spine. Increased roundness of the back or a curve to the side could be important. Your doctor will check posture and walking gait; the ability to bend over to touch the toes; and bending to the right and left. Difficulty with movement may indicate that there is a problem with the joints of the spine. 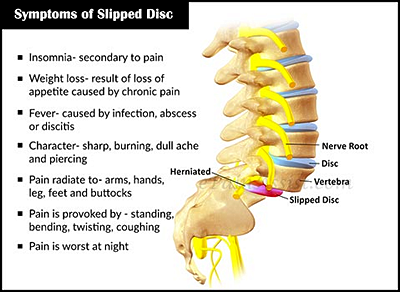 Disk problems can cause pressure on the nerves that exit the spine, so your doctor will perform specific tests for that. With your child lying face up, your doctor will raise the legs (straight leg raising test) and may also raise the legs with your child lying face down (reverse straight leg raising test). Testing reflexes and feeling in the legs will be done for the same reason. The muscles in the back and legs are tested. Tightness of the back muscles or the hamstring muscles at the back of the thigh will show that your child is trying to protect himself or herself from movements and positions that might be painful. Tenderness of the muscles will indicate a muscle injury, such as a strain. Balance, flexibility, coordination, and muscle strength. Other tests will be done to be sure the back pain is not part of a bigger picture. The doctor may use one or several diagnostic imaging tools to see inside the body. X-rays of the spine will show the bones and may show fractures, displacements, or other problems within the bones. This test involves injecting a substance into the vein and then using a special camera to see where it is picked up. It can pinpoint inflammation, infections, tumors, and fractures. Since the anatomy of the spine is very complicated and since these processes are not always visible on x-ray, the bone scan can be very useful. This is a special computerized x-ray technique that provides a three-dimensional image and allows your doctor to see things that are not visible on two-dimensional x-rays. It is particularly useful in the spine to understand the complex anatomy. This technique is very valuable because it shows tissues other than bone. It can be used to see the spinal cord, nerve roots, disks, or other soft tissues that can be very important in back pain. Blood tests, including the complete blood-cell count (CBC), or erythrocyte sedimentation rate (ESR), and C-reactive protein (CRP), can all be changed in the presence of inflammation or infection. 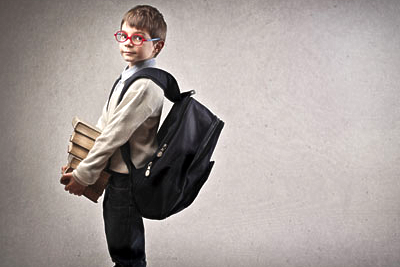 Musculoskeletal strain is most often responsible for back pain in children and adolescents. Poor posture and a modern lifestyle with computer, laptop, and ipad use for long periods of time can be factors causing this. This type of pain frequently responds to rest, anti-inflammatory medications, and an exercise program. Many teenagers may have more persistent back pain. This is often related to tight hamstring muscles and weak abdominal muscles. These children seem to improve with a physical therapy program that stresses hamstring stretching and abdominal strengthening. In adolescents, rounded back, also called Scheuermann’s kyphosis, is a common cause of pain in the middle of the back (the thoracic spine). Vertebrae become wedged, causing a rounded, or hunched, back. The curved part of the back may ache and pain may get worse with activity. 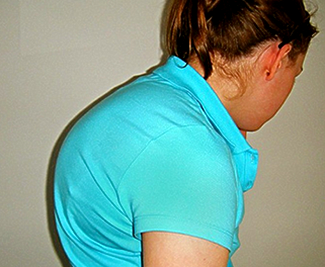 Picture Above: An Adolescent Female Presents With Excessive Roundback Localized To The Thoracic Spine. The Severe Kyphosis Is Most Obvious When She Bents Forward. Spondylolysis, or stress fracture, may cause lower back pain in adolescents. Stress fractures may occur during adolescent growth spurts or in sports that repeatedly weist and hyperextend the spine, like gymnastics, diving, and football. Pain is usually mild and may radiate to the buttocks and legs. The pain feels worse with activity and better with rest. A child with spondylolysis may walk with a stiff legged gait and only be able to take short steps. In this drawing of spondylolisthesis, a lower back vertebra has shifted forward. A slipped vertebra, or spondylolisthesis, occurs when one vertebra shifts forward on the next vertebra directly below. It usually occurs at the base of the spine (lumbosacral junction). In severe cases, the bone narrows the spinal canal, which presses on the nerves. In young children, infection in a disk space (diskitis) can lead to back pain. Diskitis typically affects children between the ages of 1 and 5 years, although older children and teenagers can also be affected. Pain in the lower back or abdomen and stiffness of the spine. Walking with a limp, or simply refusing to walk. Squatting with a straight spine when reaching for something on the floor, rather than bending from the waist. On rare occasion, tumors, such as osteoid osteoma, can be responsible for back pain. When they occur, tumors of the spine are most often found in the middle or lower back. Pain is constant and usually becomes worse over time. This pain is progressive; it is unrelated to activity and/or happens at night.